This leading annotated Criminal Code offers noteworthy comments about interesting cases, and a clearer indication of contentious issues and possible arguments that lawyers have come to expect from any other annotated Criminal Code. This is a student edition. Click here for the professional edition of The Practitioner's Criminal Code, 2019 Edition + E-Book + Supplement. Principle 5: "Cases of note" rather than "cases of not"
The Gold Code offers noteworthy comments about interesting cases, and a clearer indication of contentious issues and possible arguments that lawyers have come to expect from any other annotated Criminal Code. Each annual edition is updated and enhanced with a careful review of all "cases of note," keeping only cases that continue to be of note and adding insights on the latest noteworthy developments. 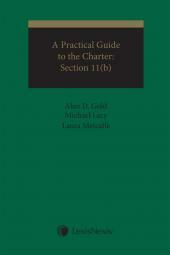 And now combining technology and Alan Gold's insights on criminal law and procedure, the Gold Code includes a complimentary e-book version that exclusively offers hyperlinks to full text cases and so you can just read the rule, tap a case and obtain it without additional charge (provided you are online). Plus you can read, bookmark, copy and email text, do key word searches and make highlights and notes. Plus, LexisNexis ebooks are optimized for all mobile devices. In force between June 21, 2018 and December 18, 2018, including Alan Gold’s commentary. 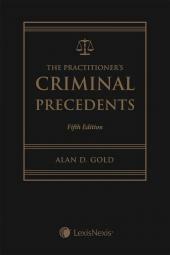 Alan D. Gold, B.Sc., LL.B., is one of Canada's leading and most successful criminal lawyers. He is the author of Quicklaw's well-regarded Criminal Law NetLetter™, and a Certified Specialist in criminal litigation. Mr. Gold was the first Chairman of the Criminal Litigation Specialty Committee, and past President of the Ontario Criminal Lawyers Association (from 1997 to 2001). In 1993, Mr. Gold was inducted into the American College of Trial Lawyers, and in 1997 he was honoured with the G. Arthur Martin Award for contribution to criminal justice. Mr. Gold has annually been selected to be included in The Best Lawyers in CanadaSM since the inaugural edition was published in 2006. Mr. Gold was thrice elected a Bencher of the Law Society of Upper Canada and served as Chair of the Discipline Hearing Panel. He then became an Emeritus Bencher. 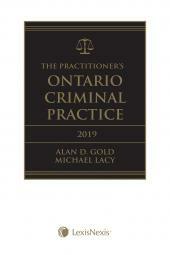 He has annually authored since 2007 The Practitioner's Criminal Code, as well as The Practitioner's Criminal Precedents (with Michael Lacy) and The Practitioner's Ontario Criminal Practice. Mr. Gold has also authored 16 annual volumes of the Annual Review of Criminal Law, the monthly Drinking & Driving Law and annually authors Defending Drinking and Driving Cases. His book Expert Evidence in Criminal Cases: The Scientific Approach was awarded the 2005 Walter Owen Book Prize, which is offered by the Foundation for Legal Research, and is designed to recognize excellent legal writing and to reward outstanding new contributions to Canadian legal literature that enhance the quality of legal research in this country. A second edition was published in 2009. He is also the author of LexisNexis Canada's Halsbury's Laws of Canada – Criminal Procedure.